Jaya was tensed, of late, as she was experiencing some abnormal red rash on her body with intense itching & burning that used to make her anxious and restless. She was more concerned as she was pregnant and she was unable to understand why this was happening to her during pregnancy. She approached her family physician who finally diagnosed it as “Pregnancy Hives” and advised her the right care and treatment for the same to alleviate her discomfort. So, you must be wondering what exactly are ‘Pregnancy Hives’. Read on to learn all about it. During pregnancy, lots of physiological changes occur in the expecting woman’s body. These changes occur due to the “Hormones”, which play an important role throughout nine months. These hormonal changes are crucial as far as the development of the fetus is concerned. However, sometimes, these changes may cause certain undesirable conditions which may make you suffer from some discomfort & irritation. For instance, pregnancy hives is an undesirable condition occurring due to hormonal changes while you are expecting. It is also known as Urticaria. The body may react to these physiological change considering them as a foreign substance (antigen) and release a large amount of histamine (which produces allergy symptoms such as rash & itching) in order to correct these changes. This makes your immune system more sensitive to external things. And, it can result in skin irritation anywhere in the body resulting in urticaria. At times, some pregnant women show an allergic reaction to food, insect bite, medicine or chemicals etc. Try to avoid stressful conditions. Also, you need to avoid tight fitted clothing and wear loose comfortable clothes to alleviate your discomfort. Urticaria may be present with dermographism or without it. 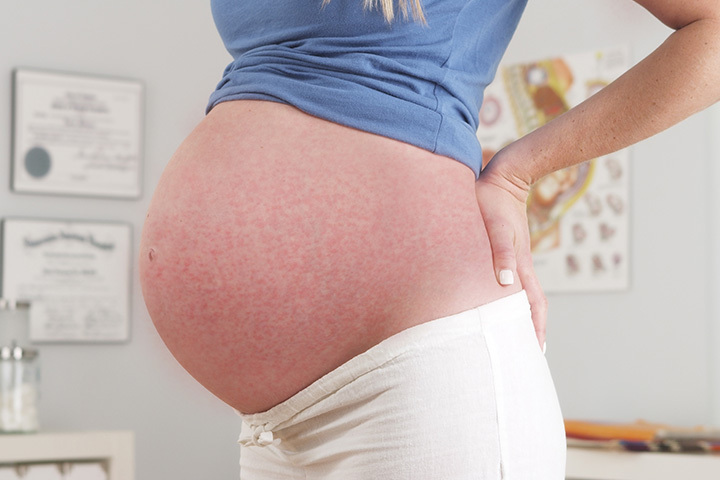 The main symptom of pregnancy hives is intense itching & burning which make you restless and impatient. Your daily routine might get hampered due to it. You might also suffer from localized swelling due to hives around your eyes, lips, and other parts; and it is known as Angioedema. Being immunological disease, urticaria treatment should focus on the root cause of disease, not on symptomatical relief. Some conventional medicines that are considered safe during pregnancy are advised by a physician to minimize the itching and swelling caused by urticaria. However, these medicines only focus on the symptomatical relief and not on the root cause. So, you need to take them periodically. Fortunately, there are some other lines of treatments which address the basic cause of such diseases and help you to get rid of them completely. Homeopathy is a more advanced, scientific, modern, safe, and more effective treatment option for urticaria during pregnancy. Homeopathic treatment for urticaria promotes deep level healing as immunomodulator i.e correction of the immune system works in such a way that the hypersensitive due to urticaria is taken care of and your body does not react the way it does with the disease of urticaria. Homeopathy helps reduce the histamine activation, minimize hypersensitivity of your skin, and mitigate exaggerated reaction to allergens. In short, homeopathy eliminates disease tendency from your body. So, choose homeopathy to get relief from urticaria during pregnancy effectively. Good study and safer treatment option during pregnancy…. Very good article! These are some important tips to deal with urticaria in pregnancy. I will share this with my friends.